I have no idea if Netflix took the U.S. presidential election into consideration in deciding when to release The Crown. But the look back at the early life of Queen Elizabeth II debuts at a time when America is grappling with the reality of what it would mean to have a woman in the highest office in the country. Questions about women and power will no doubt be central to The Crown—and they will certainly be central to the lens through which I view the show—but they merely lurk around the edges of this premiere. Before we can watch Elizabeth (Claire Foy) reign, we have to understand the world she came from. “Wolferton Splash” somehow feels both rushed and sluggish as it depicts the time between Elizabeth’s marriage to Philip in 1947 and her father’s declining days in the early 1950s. As an Elizabeth II fangirl, I’m torn between wanting the show to get to her ascension to the throne and wanting it to take more time to lay out the details of her early life. (She didn’t become the heir presumptive until her uncle Edward VIII abdicated when she was 10 years old; she joined the Women’s Auxiliary Territorial Service and worked as a driver and mechanic during the war when she was 19.) Perhaps the show will revisit her childhood in flashbacks, but for now it stays firmly grounded in the early days of her adulthood. Indeed Elizabeth herself takes a bit of a backseat this episode as the show introduces us to the men in her life. There’s a newly reelected Winston Churchill (John Lithgow), perhaps the ultimate symbol of old fashioned patriarchy, who sees it as his duty to guide young Elizabeth during her eventual reign. There’s also Philip (a perfectly cast Matt Smith), Elizabeth’s slightly unconventional choice for a husband, who bristles against the notion that—like centuries of women before him—he’ll be expected to smile and support his more powerful spouse. 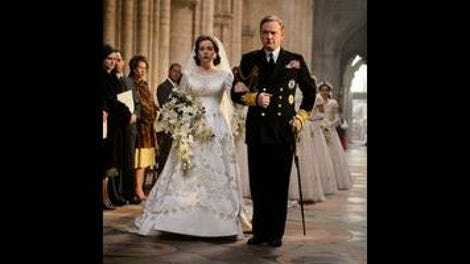 And, most importantly of all, there’s Elizabeth’s father, King George VI (Jared Harris)—the same man Colin Firth played in The King’s Speech. George largely takes center stage in this premiere as he battles with lung cancer that is far worse than anyone cares to admit. He faces his impending demise with a mixture of denial and practicality. He keeps the extent of his illness a secret from his family, but nevertheless takes steps to ensure Elizabeth gets some prep time before she officially takes over his duties. Harris beautifully embodies a man caught between his duty and humanity. He’s heart wrenching as he breaks into silent tears while singing with local carolers on what he assumes will be the last Christmas with his family, and he’s heartwarming as he bonds with his daughter. My favorite scene is the one in which George calls Elizabeth into his office on urgent business only to immediately admit he has nothing particular to talk to her about. Within the confines of their formal relationship, George and Elizabeth have found ways to genuinely connect with one another. And Foy and Harris make it clear just how much they both value their time together. Monarchy, for all its glitzy privilege, is also an insane form of mandatory lifelong public service, and George and Elizabeth are the only two people who truly understand the full extent of that pressure. That’s given them a connection they can’t share with anyone else, even their respective spouses. Because this is a story filled with British repression and propriety, the job of conveying subtext falls on The Crown’s actors even more so than it usually does in a drama. And the show’s stacked ensemble all prove more than up to the task. For instance, speaking nothing more than traditional wedding vows, Foy and Smith manage to immediately establish the dynamic of Elizabeth and Phillip’s relationship. She’s uncomfortable showing affection in public and constantly fearful of making a mistake, while he’s expressive, playful, and mercurial. She can barely make eye contact during their vows, while he has a hard time taking them seriously. Yet their two very different temperaments are also what make them effective as a couple. His goofiness lightens her, while her stateliness grounds him. Whatever problems they’ll face down the line, there’s a solid foundation to their relationship, and Foy and Smith make that clear with remarkably efficiency. For the most part, this premiere doesn’t stray too far from what we expect of our stately British period dramas. Like Downton Abbey before it, The Crown absolutely relishes the chance to show off the lavish lifestyle of the British elite (although unlike Downton, The Crown is far more interested in minutia than melodrama). 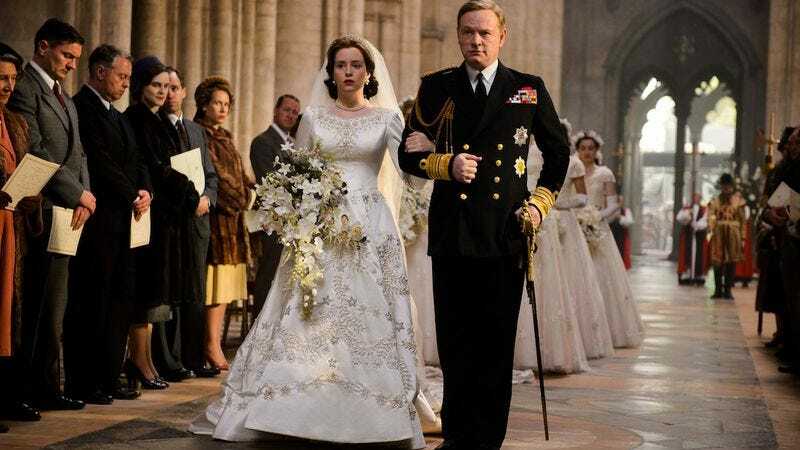 From Elizabeth’s gorgeous wedding gown to George’s elaborate duck hunting party, the show makes the most of its famously steep budget (it’s reportedly the most expensive Netflix original series ever). But the episode’s final montage also hints that The Crown won’t be afraid to break free from its highbrow period drama aesthetic with something a little more stylistic every now and again. As her husband and father enjoy the boy’s club of a hunt, Elizabeth begins to seriously contemplate the reality of making her way in a man’s world. It’s a daunting thought for a 25-year-old woman in 1951 (hell, it remains a daunting thought today for many people), and the echo of gunfire adds portent to her visit to her father’s office. Is Elizabeth up to the task of overseeing an empire on the edge of decline? And even if she is, what role does the monarchy have to play in an increasingly modernizing world? The earlier post-wedding conversation between Queen Mary (Elizabeth’s paternal grandmother) and Queen Elizabeth (Elizabeth’s mother) raises what will likely be a central question of the series: Is Elizabeth a naïve princess or a sneakily effective stateswoman? It’s the sort of question that often gets asked about powerful women: Are they good leaders or are they merely fooling us? Hopefully in teasing out the details of one monarch’s past, The Crown will illuminate a female experience that is far more universal. Welcome to The Crown coverage! Reviews will drop every other day at 3 p.m. EST. I won’t be watching ahead, so you don’t have to worry about spoilers in these reviews (in as much as this show can be spoiled). If you have watched ahead, please try to be courteous about spoilers in the comments section. The Crown creator Peter Morgan also wrote the 2006 movie The Queen and the 2013 play The Audience, both of which starred Helen Mirren as Queen Elizabeth II. Because apparently when you know something, you stick to it. I did not expect The Crown’s opening credits to be so Daredevil-y. The brief sequence in Malta has such a bright, open, carefree feeling in contrast to the coldness and formality of England. As crazy as it sounds, George VI really did have lung surgery inside Buckingham Palace. If you are into this show you should check out Andrew Marr’s three-part documentary The Diamond Queen, which is what first made me fall in love with Elizabeth II.